Week 5, time to start completing the Divemaster stuff !! Diving was limited to Tuesday and Sunday of this week, due to completing Divemaster tasks, more of than in a bit and a considerable amount of socialising! Monday consisted of me getting some more of my Diver Skills signed off, which I am now making good progress on now. Tuesday was the first of the two Yellow Mountain trips and were completed for my mapping exercise. Flo was my willing buddy that day and I was able to successfully map the Swimthrough section of the site, as well as witness one of the biggest octopuses I have seen here. On Wednesday I took my Divemaster exams and thankfully I passed the first section with flying colours and scraped a pass on the second section by the skin of my teeth – but a pass is still a pass! Thanks to a cheeky bet Flo made with me, he will be paying for meals for us at Flashpoint this Friday after I beat his overall score in the exam. This year’s Halloween was my first experience of the day abroad and it did not disappoint. This year the theme was vampires and it was great to see everyone (including Nick and Linda) putting effort into their outfits. We started off with a fabulous meal at Buon Italia, then went to The Bar where I blew everyone away with my karaoke skills (slight exaggeration there I might add) Ebb and her visiting sister Lexi got wasted at Taj’s and I got my first taste of Taboo’s nightclub, albeit only for about an hour before everyone deserted me there. The other diving day of the week involved us taking Lexi out on a dive and we also brought Flo’s other friend Pieter along for a Discover Scuba Diving expedition. I met Hermit for the first time and took him to the swimthrough and to Alien Rock where we saw a school of about 50 barracuda, a huge moray eel and two big cuttlefish near our anchor line. 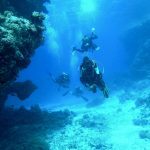 Tagged: Discover Scuba DIving Tenerife, Diving in Tenerife, Diving Tenerife, PADI Divemaster internship Tenerife.